Dr. Who" fans have had to deal with a sequence of actors playing the iconic science-fiction character over the past 47 years. A gimmick written into the show allows the time traveler to assume a completely different look (to be played by a completely different actor). Matt Smith is the 11th Doctor as he steps in for the recently departed Dave Tennant. The episode that introduces Smith airs at 9 p.m. today on BBC America. It'll take a few episodes to know if Smith's a fitting replacement, but he makes a strong showing in his debut. He provides the manic energy and odd sense of humor that made Tennant such a popular Doctor. He might eventually carve out a more distinct version of the role, but his work in the opener is a great bridge from Who to Who. The initial challenge for this Dr. Who is to save the world in 20 minutes from aliens willing to fry Earth just to dispose of an es caped prisoner. It's not the most creative story, but functional enough. As has been the trend in recent years, the good Doctor will not travel alone. This time he's picked up Amy Pond (Scottish actress Karen Gillian), a spunky young woman who became obsessed with the Doctor when he time-traveled into her life when she was a child. The relationship between Dr. Who and his traveling companion has become another interesting layer in this long-running series. APA 6th ed. : Bentley, Rick (2010-04-17). New 'Dr. Who' premieres. South Bend Tribune p. D8. MLA 7th ed. : Bentley, Rick. "New 'Dr. Who' premieres." South Bend Tribune [add city] 2010-04-17, D8. Print. Turabian: Bentley, Rick. "New 'Dr. Who' premieres." 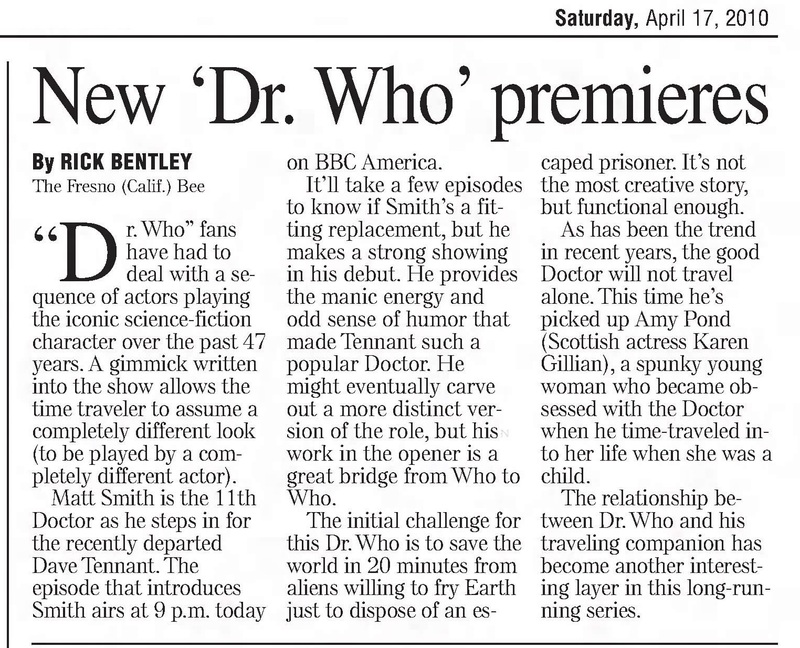 South Bend Tribune, 2010-04-17, section, D8 edition.